During ski season, Paul Marshall is all about on-hill safety as the Assistant Director of Patrol. 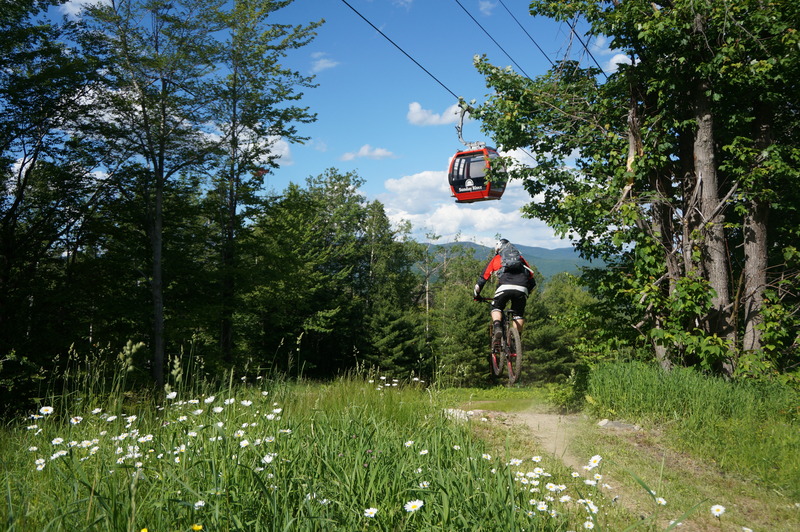 Come summer and fall, you’ll find this seasoned downhiller perfecting the badass trails of the Sunday River Bike Park as a crew member, ripping around on his beloved Santa Cruz VP-Free bike. We pried him from his daily responsibilities to give us the rundown on his favorite trails. Why Ride It: It’s a smoother, machine-built, mostly open slope that’s a great trail for novice riders to hone their skills. Gnarliest Feature: There is a slab of slick rock in one of the lower turns that is a lot of fun, especially when it’s a little wet. Pro Tip: The key here is to stay balanced and control speed without breaking traction. Why Ride It: The best thing about Tango is the variety. 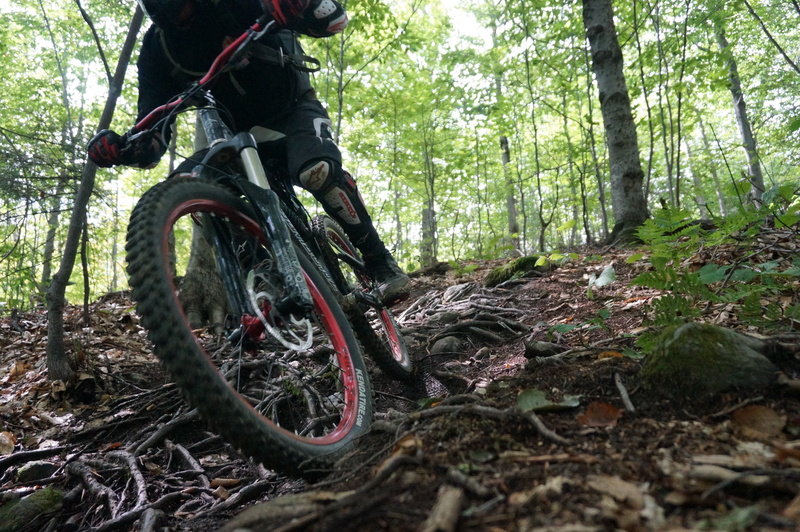 This trail starts with a flowy, hand-built, natural single track section in the woods before opening up into machine-built, high-speed turns in one of the mountain’s most popular winter glades. There are drops, jumps, and steeps, with plenty of berms to tie it all together. Gnarliest Feature: A snowmaking pipe drop in the top section seems to intimidate people, as well as a long, steep descent in the lower glade section. Pro Tip: You can definitely roll the pipe drop in the top section, and it helps to stay outside of the turn to keep your speed up. Even experienced riders may start to pump out in the lower section after braking at high speed on one of our longest, fastest, most uninterrupted trails. Why Ride It: Rock Star is full of fun and challenging hand-built features from the Birch Drop to a couple of bridges, and the biggest drop in the park, which is incidentally much smoother than its ride-around option. This summer, we added a new entrance just uphill from the top of the Chondola that puts the entire trail into the woods. Pro Tip: On the approach to that drop, you’ll know you are squared up when you see the bridge beyond the landing. You’ll know where you need to end up, though you won’t see where you are going to land until you take off. Why Ride It: Crater is arguably the top pick for SRBP’s regulars. The classic New England rocks and roots mixed with the pump and flow on turn after turn of hand-built, gravity-fueled gnar is the pinnacle of what we have to offer! Gnarliest Feature: The most surprising feature on Crater this summer is the renovation of the bottom section with the help of a little orange Kubota to smooth out and speed up this classic piece of woods. 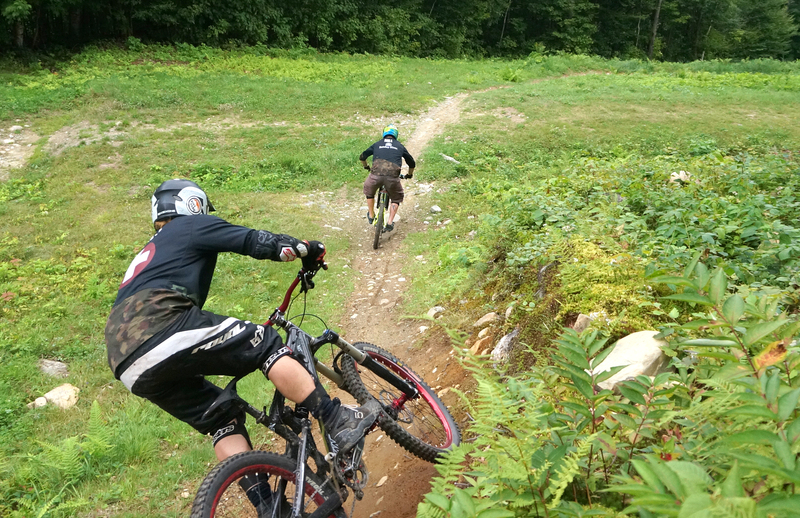 We added several new jumps and berms to make this a great option for both novice and expert downhillers. Pro Tip: The trick is to maintain speed and round out all of the turns by taking the high/outside line wherever possible. Why Ride It: Rock Garden is made up of four sections top-to-bottom and exhibits the full spectrum of what’s possible here. The uppermost piece is accessible from the top of North Peak after a short hike. It’s a low-angle single track with rocks and roots that crosses Three Mile Trail. The second is steep, gnarly, rocky, and rooty, and proves challenging even for someone who knows all of the lines. Narrow benches and every kind of rock we have dot this techy single track. The third section got a facelift last year and features hand-built turns. The final section was recently completely rerouted by an excavator and finished my hand. It’s the biggest upgrade to the park this season. Gnarliest Feature: The headwall in its entirety. Pro tip: Line selection and momentum are the keys to a dab-free descent. 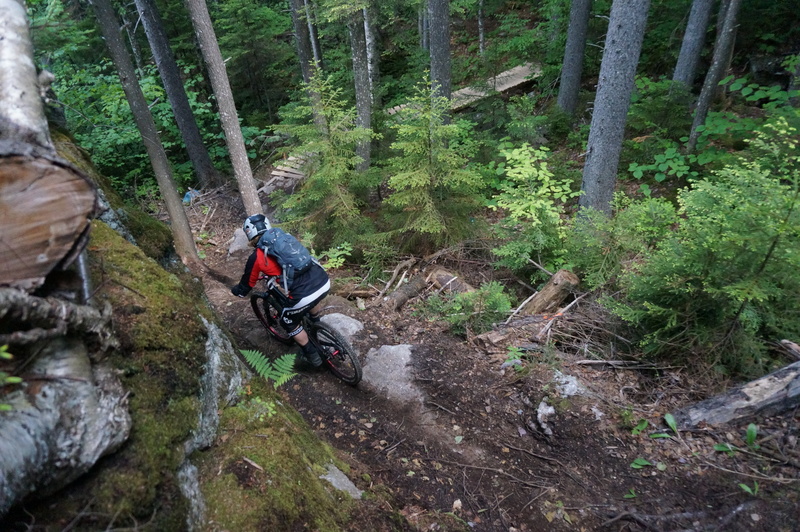 Why Ride It: Moose Tack starts off with beautiful glacier sculpted slick rock and finishes with fast, hand-built turns, drops, and rock gardens. Gnarliest Feature: The steep slick rock is intimidating and can be slippery when wet, but is among the most unique surfaces we have to offer. Pro Tip: Trust your tires and try to round out the turns. We spent time removing some of the pesky roots on the upper section to improve contact with the granite.